Sure, perhaps the storied NBA rivalry between the Boston Celtics and Los Angeles Lakers isn’t all it used to be back when James Worthy, Kevin McHale, Michael Cooper, Dennis Johnson, Kareem and the Chief were chucking elbows and sweating it out in the old, completely un-air-conditioned Boston Garden. But that doesn’t matter to a Boston boy like Conan O’Brien. At least not when he can summon Laker legend Magic Johnson for a little trash talk-reignited hoops feuding. And, okay, maybe Magic isn’t exactly in playing shape any more. (Although he doesn’t look bad for 58.) 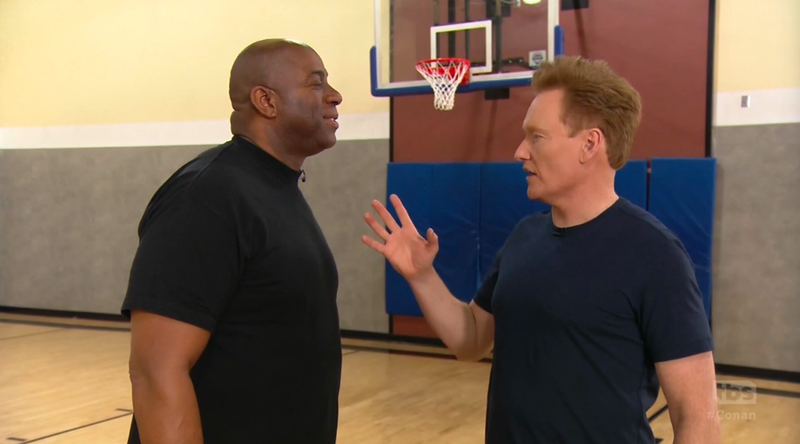 But, since, on Tuesday’s Conan, he and O’Brien were only duking it out in a safely, mostly stationary game of Horse, the two towering b-ball gladiators were evenly matched. Oh, wait, no they were not. Not at all. Not remotely. On the one hand, Conan may be six-five to Magic’s six-nine, but, as Conan put it, his signature orange pompadour brings them almost even in height. (Pus, the host demonstrated his willingness to look at least as ridiculous as Magic used to in those 1980s short-shorts.) Still, once the contest got underway, it was clear that O’Brien just didn’t have game compared to his Hall Of Fame opponent, creaky knees and all. O’Brien attempted to even the odds after falling badly behind, bringing on some Globetrotters-style prop-based trick shots and even trying to psych Magic out by donning the very face of his greatest adversary. But it was not to be, as the spirit of Larry Bird seemed to flow through the eyeholes of the paper mask of Bird’s face that both O’Brien and Magic donned to sink matching set shots. At least die-hard Bostonian Conan can take solace in the fact that the real-life Celtics currently have the edge over the floundering Lakers—and that his career as a late-night host has lasted some 25 years longer than Magic’s. Advantage, O’Brien. 30 For 30: "Without Bias"